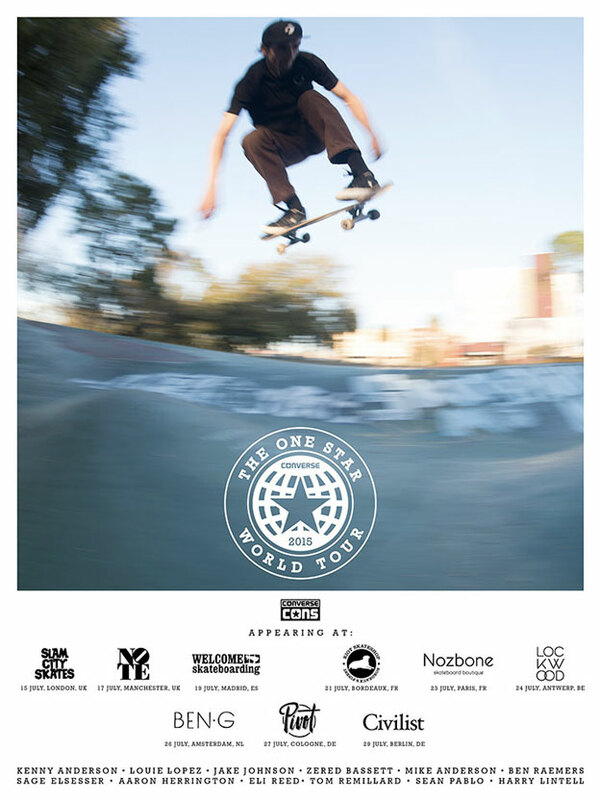 Converse presents the One Star World tour, which will be hitting Europe from the 15th July, 2015. First stop on the 15th is with Slam City Skates in London with a demo after at Mile End Skatepark. We’ll then be heading up to Note in Manchester on the 17th then moving on to Welcome in Madrid, Riot in Bordeaux, Nozbone in Paris, Lockwood in Antwerp, Ben G in Amsterdam, Pivot in Cologne, finishing at Civilist in Berlin on the 29th July. Along for ride is Kenny Anderson, Jake Johnson, Zered Bassett, Mike Anderson, Ben Raemers, Aaron Herrington, Eli Reed, Tom Remillard, Sean Pablo, Louie Lopez, Sage Elsesser and Harry Lintell. Plus the Cons European crew at each tour stop. Check your local skate store above for more information.